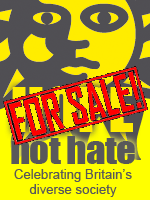 Because Hope not Hate is a political campaign group and not the grass roots campaign it claims to be, they have to declare donations over £500 to the Electoral Commission. Henry Tinsley is a Lib Dem and board member of left wing lobbyists 38 Degrees who is currently campaigning against the British governments botched attempts to tackle political lobbying by people like him and the organisations he's backing. We aren't aware of Malik Karim's background at this time. Every other donation over £500 that hasn't been anonymised is from the trades unions and left wing lobbyists Joseph Rowntree Trust. You'll note that their big donations are all made during election campaigns - the 2004 EU elections, the 2005 general election, the 2009 EU elections and the 2010 general election. Hope not Hate's main line of business is political campaigning on behalf of the trades unions and the Labour Party which is why their attacks on UKIP started when by-election results started showing that UKIP are as much of a challenge to the Labour Party as we are to the Tories and Lib Dems. Hope not Hate may have started out intending to be a grass roots anti-fascist campaign group but it's nothing more than a front for the Labour Party and trades unions. Proscribing the organisation as a majority of members at this year's conference voted to do would be daft but every time Hope not Hate launch a politically-motivated attack on UKIP the party should respond by reminding the press that Hope not Hate is a political front organisation doing what they're being paid to do by their paymasters.